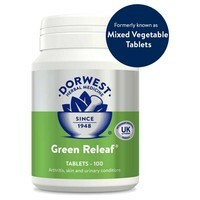 Dorwest Green Releaf Tablets for Dogs and Cats is a licensed herbal medicine that captures the essence of selected fresh green plants and their seeds, and have natural anti-inflammatory, anti-histamine, anti-bacterial and pain relieving properties. The main uses of Dorwest Green Releaf Tablets are the symptomatic relief of arthritis, skin and kidney disorders, and as a diuretic to aid normal urinary eliminations. They can also improve mobility and reduce irritation caused by various skin problems. The tablets also promote mild water loss, helping to maintain normal urine flow and pH (acid/alkali) balance. We used these to help with my dog's fracture site. We gave them to her a week after the fracture occurred. So far so good, I think it was money well spent. They were recommended to me by a GSD owner who had used them, he noticed a huge improvement in his nearly 10-year-old. These tablets were delivered next day, what good service Vet UK provide, I have purchased several items for my staffie cross and have been pleased with everything and all deliveries were exceptional, thank you.